When I was in school, I equated history with a dry textbook or outdated movie. After a while, I zoned out and quit listening. When my husband and I made the decision to homeschool our children, above all else, I wanted our kids to enjoy learning. I wanted learning to be as fun, meaningful and memorable as possible. That goal has become a reality thanks to the many educational family travel opportunities that we’ve had over the years. I have learned much about the past, and developed many interests due to our travels, and so have my children. 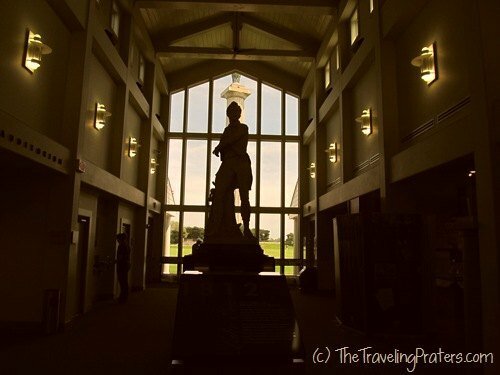 It’s locations like Perry’s Victory and International Peace Memorial that have taught both of my boys to love history; and taught my daughter to appreciate the people and events that have transpired before us. You may not think of Put-in-Bay for its educational family travel opportunities, but I’d like to do my part to change that. 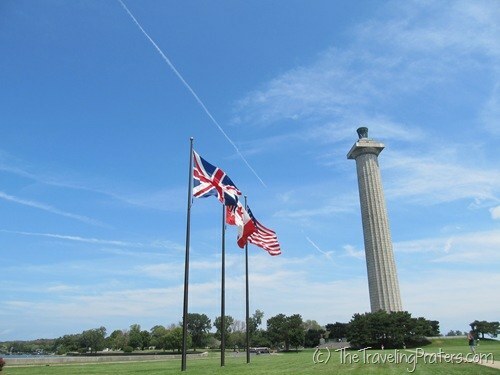 Perry’s Victory and International Peace Memorial honors those who fought and died during the Battle of Lake Erie in 1813, as well as the War of 1812. It was during this battle that Commodore Oliver Hazard Perry raised the flag bearing the famous words, “Don’t Give Up the Ship” that has become a creed of encouragement, determination and honor among the US Navy. Today, Perry’s Victory and International Peace Memorial serves as the only international peace memorial in the National Park System. It also celebrates the continued peace between Britain, Canada and the United States and the longest lasting peaceful border between two countries that were once at war, Canada and the United States. 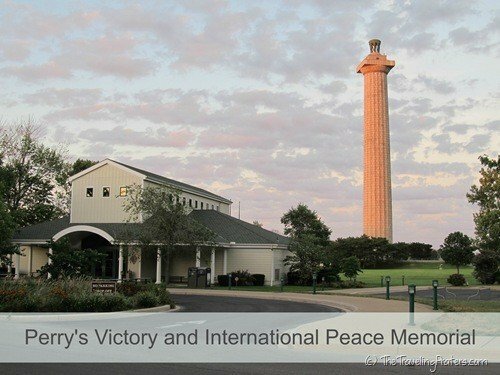 Your visit to Perry’s Victory and International Peace Memorial should begin in the Visitors Center. 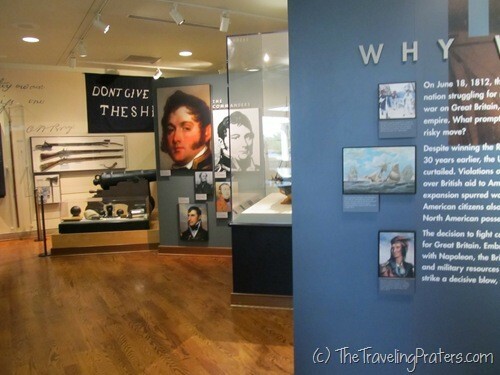 The educational center, newly constructed in 2002, will give you an overview of the War of 1812, familiarize you with the pivotal battle that took place on Lake Erie, and introduce you to Commodore Oliver Hazard Perry through hands-on exhibits, a short 15 minute film and Ranger led talks and demonstrations. Of all the places we visited while on South Bass Island, this memorial was my husband’s favorite. Not because he loves history (he does) but as a contractor, he appreciated the labor that went into constructing this monument and the attention to detail of the beautiful structure. A paved walkway leads visitors past the British, Canadian and American flags on the way to the monument. 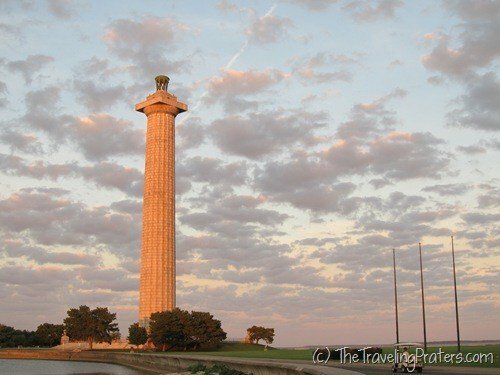 At 352 feet tall, Perry’s Victory and International Peace Memorial is tallest Doric column in the world, and according to the ranger, the 3rd largest monument in the United States. Only the the Washington Monument and the St. Louis Arch exceed the memorial by height. The nearly 100 year old memorial, which had been closed for renovations, reopened in July after undergoing needed repairs. The exterior column of the monument is constructed of pink Milford granite from Massachusetts. When the color is reflected off the blue of the sky and the water, it looks white. The remaining granite used in the construction of the memorial was shipped from a number of states as a way to honor those who fought in the battle. Outside the memorial are four pillars with an urn placed on top. Each pillar represents one of the four major ships used in the Battle of Lake Erie by Commodore Perry. Six officers who died in the Battle of Lake Erie were buried in an unmarked grave in Put-in-Bay with the intentions to send the bodies home at a later date. That didn’t happen and when the grave was excavated and the bodies unearthed, it was unclear who was American and who was Canadian. 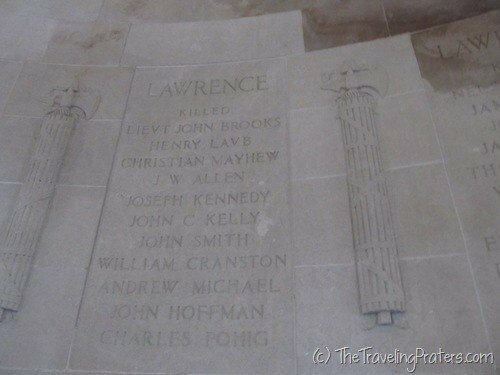 The remains of these men, three Canadian, three American, were transported and interred under the rotunda of the memorial. 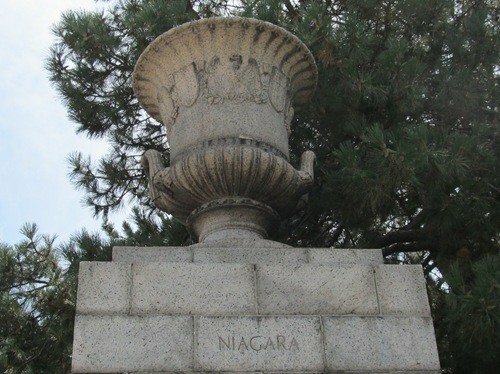 Today you can read the names of the men who died in the Battle of Lake Erie, as they are memorialized on the walls of the memorial. 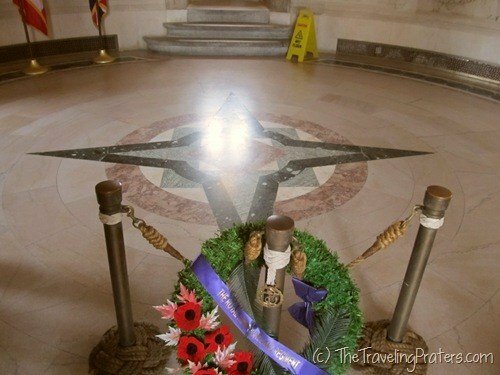 After paying your respects to the fallen and those that have battled for our nation’s freedom, you can climb about 40 steps to the historic Schindler elevator. The elevator transports 10 passengers at a time to the Observation Deck located 317 feet above ground for the best view overlooking Western Lake Erie on South Bass Island. If you have younger children, you may elect to have them participate in one or both of the Jr. Ranger programs offered, adding to the educational family travel aspect of the memorial. You can pick up a booklet for 6-9 year olds or one for 10-12 year olds which is specific to Perry’s Victory and International Peace Memorial. There is also a Jr. Ranger book available on the Great Lakes that teaches children about the importance of our Great Lakes and how to protect them. 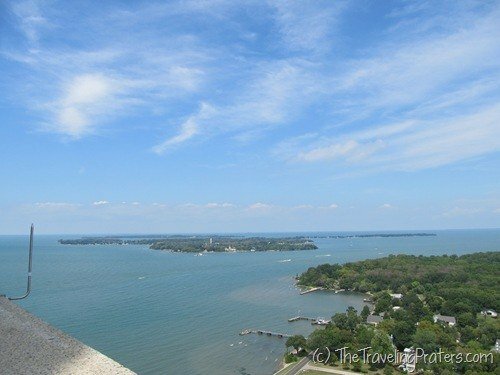 Though you could visit the observation deck just to take in the view, I highly recommend spending a fair bit of time familiarizing yourself with the War of 1812 and Battle of Lake Erie in the Visitor Center. For those that have a deep interest and appreciation of history, you could spend 1 1/2 to 2 hours or more at the site. Special events and musket firings are offered on select days. Visit ww.nps.gov/pevi for a current schedule of events. Hours: Open daily Memorial Day to Labor Day from 9 a.m. to 7 p.m and the rest of the season from 10 a.m. – 5 p.m. The Visitor Center and Observation Deck will close for the season the end of October, and reopen in April. Children 15 and under are free but must be accompanied by an adult. Educational Groups: Rangers at Perry’s Victory and International Peace Memorial offer several field trip options for Boy Scouts, Girl Scouts, area schools and homeschool groups. I highly, highly encourage a field trip here. If you are a public school teacher, find out how you can participate in Pass the Peace, a program that pairs American and Canadian 7th and 8th grade students to teach them about the battle from a different perspective. Pass the Peace makes use of modern technology and social networks like Skype and Facebook, to teach cultural aspects and differences before traveling to either the US or Canada to meet the class they have been interacting with. And while you’re on the island, consider making it a full day with a trip to the Aquatic Visitors Center, Stone Lab on Gibraltar Island (I’ll share more about these amazing places later), the Lake Erie Islands Museum and the Lake Erie Islands Nature and Wildlife Center. 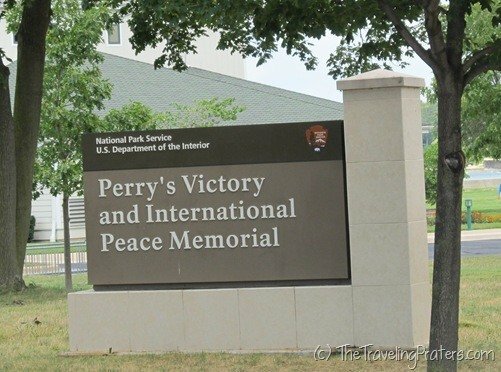 Have you been to Perry’s Victory and International Peace Memorial? What are you waiting for? This post is linked to Friday Daydreamin’ with R We There Yet, Mom? Hop on over for a bit of travel inspiration. Disclaimer: Our tour of Perry’s Victory and International Peace Memorial was arranged and provided complimentary by Lake Erie Shores and Islands. I was not monetarily compensated for this post. All opinions are my own. That looks like such an interesting historical site! There is a fair bit going on this side of the border to commemorate the bicentennial of the War of 1812 as well – I like that the focus is one of celebrating the fact that Canada and the U.S. have been able to live peacefully side by side for such a long time. Lisa, I actually thought of you and your family when I was writing this up. I wondered if you’d been able to make it to any of the War of 1812 festivities on your side of the border! What a great post 0 I love historical places like this – I would never have known it exhisted had you not told us about it! !